Harvard slashes tuition. Americans thank the Lord. In a rare bit of good news, the intersection of supply and demand slipped a bit at Harvard University yesterday. Harvard announced it would slash its tuition to a new scale based on a percentage of a family’s income. Families earning more than $60,000 a year would pay just a fraction of their annual income as tuition, and families in the mid-tier of $120k to $180k would pay only 10% of their income. This means a family earning $140,000 a year would pay only $14k annually to send young James off to a top school … a far cry from the 200 grand it now takes to send kids to four years of Ivy League ed. This is an extraordinary move. Is Harvard’s enrollment down? Is Harvard positioning itself as an industry leader? Does Harvard think the future of elite intelligence lies in Middle America? 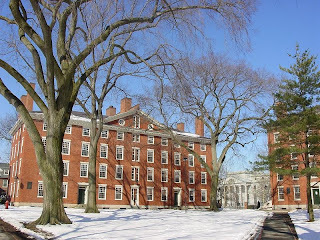 Doe Harvard find those bratty kids from private schools just too annoying? Dunno. The competitive advantage or PR buzz may not last, as other colleges and universities pick up the wave. We hope. Schools here in the states are way too damn expensive. As the elite schools compete fiercely for elite students, the elite students with less means will now flock to Harvard. Of course, today 90% of Harvard’s students probably come from super-elite families earning more than $180k a year … and if so, Harvard just won a PR coup while putting a fraction of its revenue at risk. Nice pricing strategy.